Ask fellow campers about "Desert Willow RV Resort" and nearby attractions. Very nice park in the desert but close to all the city stuff. Large pool and hot tub! Stayed for a few weeks, even broke down here and was able to change injector out in my RV site. A lot of full timers in the back. You can Uber anywhere for fairly cheap. Would come again when we visit our friends in Adelanto. We camped at Desert Willow RV Resort in a Fifth Wheel. quiet, but spaces are very tight. Slide outs meet your neighbor. Too many section 8 residents bring down the park. No TV unless you stay a month. 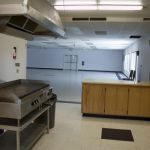 Good location, close to stores and restaurants. We camped at Desert Willow RV Resort in a Motorhome. We stayed here several times in past years. This will be the last time. The park is over run with full time residents who have cable TV. No cable for short stay residents. Antenna reception is poor. No major network Channels. The spaces are gravel and narrow. We camped at Desert Willow RV Resort in a Motorhome. This was a very good place for a one-night stay. They have a number of pull-thru spaces right behind the office for overnighters. Our site was a little short for our 40' plus toad, but we made it work, and it was very convenient for pulling out again in the morning. We arrived after closing time so the office left a packet for us on the door. They didn't even require prepayment, just left a form for us to fill out and trusted us to pay. The RV park is behind a security gate and they gave us a temporary code to get in. Very close to the freeway and adjacent to fuel stops. Quiet on the one night we spent. We camped at Desert Willow RV Resort in a Motorhome. We stayed at the Desert Willows for a one night stay-over. The park is very clean with gravel sites. At this time of year it's very cold so any outdoor amenities would not be used much but there weren't any (picnic table or fire ring). Our pull-through site was mostly level (P2). I really needed to add our portable step at the front door as there was a good distance without it once the coach leveled on the air bags. The site was just long enough for our coach and tow vehicle (about 65 ft.). The only problem was that the garbage truck came by at 6AM and it was loud with them emptying the dumpsters. The antenna TV reception was a little bit limiting as the mountains block the reception from Los Angeles. We were able to get 2 of the major networks and a bunch of junk stations. Cable is only offered longer than a weeks stay which is a negative. We camped at Desert Willow RV Resort in a Motorhome. Neat and clean. Showers were definitely lacking so I opted for the RV shower. The biggest disappointment was the wifi. They made such an big deal of the logging in process, assigned our own log in, it was a time consuming process and then the wifi didn't work! My phone reception was way better when we pulled out of the gate! Level gravel pads, no concrete pad. No tables, BBQ or fire rings. Mostly permanent residents. Don't list wifi as an amenity if it isn't available! We camped at Desert Willow RV Resort in a Motorhome. Nice park. It is clean, gravel sites that are level. Security gate, pool laundry facilities. 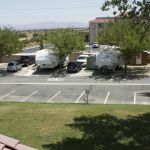 We camped at Desert Willow RV Resort in a Travel Trailer. Great spot for a overnight. Some sites long enough so you don't have to disconnect. Dog friendly, Utilities worked fine. Will stop again. We camped at Desert Willow RV Resort in a Fifth Wheel. Would say that park is average. While it is gated, the only gate that is closed at dark is the entry and yet the exit is immediately to the west of the entry gate. Pool is clean, however there are not any umbrellas around the pool so unless you are swimming it is definitely too much sun. While there is both 30 amp and 50 amp service as well as sewer and water and wifi there isn't any cable tv available unless you are a permanent resident. One of the staff in the office was exceptional at his job. The week prior to our stay we went into the office and indicated that we were planning on coming back the following week for birth of our 4th great grandchild. This staff member also followed up via phone to confirm that we would still be coming to Desert Willow RV and that everything was a go. We camped at Desert Willow RV Resort in a Motorhome. Park is clean and quiet even with permanent and long term quests. Security gate is closed at night. Facility has pool, hot tub, pool table room, library and club room. Club room only appears to be open to rv clubs. Restroom/showers are minimal. Two showers, sink and toilet. Wifi is through Tangonet. Slow most of time. No cable and very limited access to channels. Some sites have trees so rv's need to be really careful when pulling in and out. Saw Fifth Wheel scrape roof and tear off vent cover. Sites also have metal poles by outlets. Need to careful when opening slides. We camped at Desert Willow RV Resort in a Motorhome. This is only an OK overnight stop RV resort. It does not have WiFi, no cable (and no channels over the air) and no table or BBQ pit. Just a site, that was also not level. If you just want a place to stop on your way to Southern California, it would work. But that is about all. We camped at Desert Willow RV Resort in a Motorhome. Nice park, mostly gravel sites, some concrete patios. Our site wasn't level but doable. Not much shade in March but will be later in the year. Allergy season so didn't try the facilities, just watched the pollen fly. A convenient stop, far enough from the highway to be quiet. We camped at Desert Willow RV Resort in a Motorhome. Older park with gravel sites, some concrete pads, full hookups, some nicely shaded areas. Nice pool and hot tub; very clean and well-maintained. Staff was friendly and helpful in getting us into a spot that was large enough for the motorhome and tow car. Note: if you are a "big rig" be sure to mention it when making reservations. Even the pull-throughs can be tight. Some pluses: easy access off Main St., gated, pretty quiet, and lots of restaurants and shopping nearby. Would stay there again. We camped at Desert Willow RV Resort in a Motorhome. 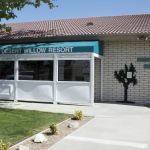 We recently booked a stay at Willow Oaks Park, in Hesperia, CA, based largely on their Good Sam listing (9.5, 9, and 7.5) and their website. We arrived on Thursday, October 1, and paid for four nights in advance ($148.00). Our experience was quite different than what was promised. Our site was basically a space on a gravel parking lot, with little space between rigs. Their listing says cable access - but after you have paid you find that is only for monthly occupants. Since we couldn't have cable access, the site says, "The club house includes a big screen television and comfortable seating area. . ." Looking through the window of the locked door, we saw a television with two old, saggy couches next to it. When we tried to gain access, we were told you could only go in if paying to reserve the club house. Because of health issues, a spa is one of the reasons for us to choose a campground. Their "indoor spa" was quite anemic, not all of the jets were operational, the spa did not appear to be properly maintained and was in an old, dirty, cell with bars on the window. BBQs and picnic tables that are pictured on their website are not anywhere near where you are parked. First thing in the morning, I went to the office to say we would not be staying, and explained our dissatisfaction. I was referred to the sign which claims, "No refunds are given for early departure for any reason." We camped at Desert Willow RV Resort in a Motorhome. Stayed one night as planned. Started out on the wrong food as entrance is not clearly marked and GPS takes you to the gate of a mobile home park with no turn around. We have a 40 foot rig with a tow and basically hanging out in the street. Long story short after a phone call and help from a resident we are in the mobile home park which enables us in the rv park. A simple sign on the corner of the rv park and a no entrance to rv's on the mobile home park could solve all this. No cable as mentioned by others. Pull through was good, easy out, clean and quiet. Nice pool, close to shopping, friendly staff. Would stay here again. Watch your directions! We camped at Desert Willow RV Resort in a Motorhome. Five Guys is within easy walking distance! Are you affiliated with Desert Willow RV Resort ?